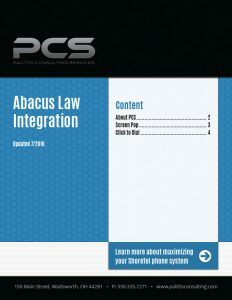 The PCS development team currently has two integrations with Abacus Law and ShoreTel. The integrations are Screen Pop and Click to Dial. The Screen Pop integration opens a new web browser tab based on the incoming Caller ID. If the caller ID is known, the application pops a new call notes screen and if it is unknown it pops to a new client screen. The Click to Dial integration allows agents to outbound dial from the Abacus Law application. The PCS universal Dialer application uses proprietary phone number sensing technology to dial from anywhere in the application.